The vast environments surrounding gravitationally-bound clusters of galaxies are very dynamic places. The material between the galaxies in the cluster is stirred on scales of a hundred thousand lightyears or more, and temperatures range from a few degrees above absolute zero to millions of degrees. The straw that stirs this cosmic drink is usually a supermassive black hole in a galaxy near the cluster center. Compared to the size of the cluster, these black holes, measuring millions to billions of solar masses, are tiny, fitting comfortably within our solar system (well, maybe it wouldn't be so comfortable for us). This tiny engine is so powerful it affects material on scales nearly a billion times larger. Power is provided by the accretion of material onto the black hole. The energy released by this accreting material both feeds the black hole and produces enormously powerful particle jets blasting into space. These jets transfer energy to the cluster environment, in a long-lived cycle of infall and outflow that astronomers call feedback. The image above, of a galaxy cluster known as Abell 2597, gives us arguably the best view of how this process actually works. 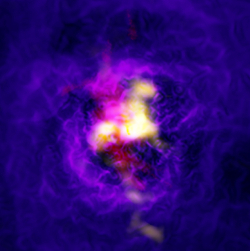 This image combines a map of the hottest, X-ray-emitting gas (from the Chandra X-ray Observatory, in purple), warmer emission from gas in the optical (in red, from observations with the MUSE instrument on the Very Large Telescope), and cold, molecular gas (in yellow, as measured by the Atacama Large Millimeter/submillimeter Array). The cold gas forms a misty fog which falls towards the central black hole. Some of this material is accreted by the black hole, and some expelled as jets of high energy particles. These jets blow through the cold gas and heat the outer, surrounding gas to enormous, X-ray emitting temperatures, and produce giant bubbles which rise away from the black hole through the hotter, denser gas. Material piles up on the front of these X-ray bubbles, and, like water falling off a balloon, rains down toward the black hole. The optical emission is largely produced by the warm gas at the cloud surface where the cold and hot gas meet.